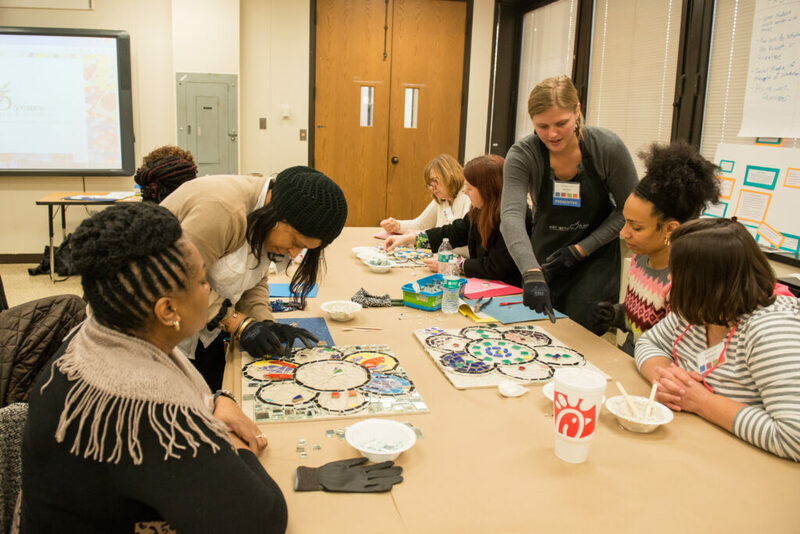 Nearly 200 educators, students, artists, and administrators attended the 10th Annual Arts Integration Conference on Saturday, March 5 at UMBC. The event was hosted by UMBC’s Department of Education in cooperation with The Shriver Center. This year’s conference, titled The Heart of Arts: Building Community through Arts Integration, focused on how integrating visual arts, dance, music, and theatre into P-12 curricula can help build cultural awareness, enhance community engagement, and provide opportunities for students to become advocates for social justice. The conference was developed for P-12 teachers, teacher candidates, youth leaders, and others who work with students through the arts. The event included an interactive general session, 14 hands-on workshops, and an art show where conference attendees interacted with Baltimore City student artists. Many UMBC alumni participated in the conference, including presentations and remarks by Kevin Maxwell ’02, Ph.D., language, literacy, and culture, CEO of Prince George’s County Public Schools, and Margaret Weber ’12, M.A.T., art education, New York City Public Schools visual arts teacher. Weber shared best practices for producing engaging lessons that address cultural relevancy through her interactive presentation “Hallway as Canvas: Bringing Graffiti Art Techniques into the Classroom.” Other presenters included Fabiola Rodriguez ’16, M.A.T., and her UMBC PDS mentor, Sara Murphy. Frank Anderson, assistant director of The Choice Program at UMBC, led an interactive general session titled “Giving Students a Choice through Socially Engaged Art.” Choice Program youth shared how their arts-based visual, music, and dance projects have helped them engage with their community, including a shared mosaic created with the Baltimore City Police Department and an audio recording of a community sound collage. Meghann Shutt, assistant director of the Shriver Center Peaceworker Program, and several Shriver Center Peaceworkers provided readings from Voices of a People’s History. Many UMBC interns and students, UMBC Professional Development School (PDS) teachers, teachers from six Maryland school districts and Washington, D.C., and students and faculty from the University of Maryland, College Park and Towson University participated in the conference. For more information, visit the education department website. Image: The Department of Education Arts Integration Conference at UMBC, March 5, 2016. Photo by Marlayna Demond ’11 for UMBC.